In this article, I’ll talk about the range of bench planes, their sizes and purposes. All of the bench planes (those that range from a #1 up through a #8) get split up into three basic categories: Smoothing planes, Jack planes and Jointer planes. Each of these categories perform specific functions, but can ultimately cover ground outside of the primary function. Starting with the smallest (and smallest numbers) are the Smoothing planes. This encompasses the #1 through the #4 1/2, and the primary differences are the size and weight. The Smoothing planes are used for, well, smoothing a surface. These are usually setup for use with an extremely sharp blade just barely protruding and a very small mouth opening. This setup is ideal for taking a very fine shaving from a piece of wood that is already flattened, which ultimately can leave one of the best surfaces a piece of wood can ever hope to have. The next group is the Jack planes. These are the # 5 & # 6. Size and weight are the primary differences between these two planes. The Jack planes are usually setup to deal with initial stock removal (when the job isn’t so severe as to warrant using a scrub plane, which we’ll touch on in a later segment), which will deal with rough surfaced wood that may have a multitude of negative characteristics (twist, wind, bow, etc…) that are between you and a flat, square piece of lumber. 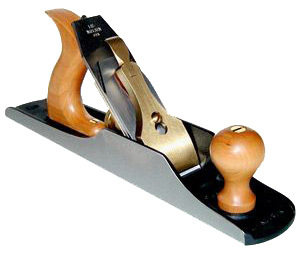 Since the wood the Jack plane is used on is not usually flat and square, this plane is often setup with the blade protruding deeper and the mouth set much wider (to handle the thicker shaving created by the further advanced blade). These settings allow the plane to rapidly remove material, but will normally require additional work. The last of the bench planes are the Jointer planes. These are the #7 & #8. Size and weight are the primary differences between these two planes. The Jointer plane setup is somewhere between the Smoothing plane and the Jack plane, but usually much closer to that of the Smoother. 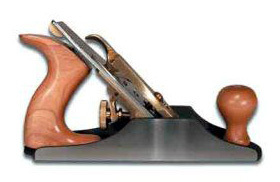 The Jointer plane’s primary purpose is to flatten wood. Always remember that even though a bench plane size is normally used for a specific function, many can be used in other ways. An example would be using a Jack plane with the blade opening closed up and the blade projection reduced, so it could function as a Smoother. So now that you know how the planes sort out, the question is whether someone needs one of every size. Part of that depends on whether the end-user works with a wide range of sized projects. If the answer is yes, then it becomes a personal decision. I personally would recommend starting with one bench plane in each group and then expanding your set if/when it is necessary or desired. 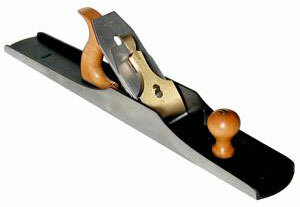 Now that we’ve covered all the bench planes, you may be wondering about block planes. We’ll be talking about those in a later post, so check back again later. Highland Woodworking’s full selection of Lie-Nielsen hand tools. ok, say i have one of each (each on the smaller side of the scale, i primarily work on smaller size projects due to my shop being in the living room of my apartment) would you suggest that i put a double bevel on ALL of them, or just those who only take the smallest amount on each pass? of the micro bevel is to minimize sharpening time. As a frame of reference, if I’m starting with a freshly ground blade at 25 degrees from the factory, by elevating to 30 degrees (adding in the 5 degree micro bevel), I can normally prep the edge with between 5 – 7 strokes on the 1000 grit stone. I then follow that with the same number of strokes on the 8000 grit stone. I also use the ruler trick for the back of my plane irons, which only polishes the leading edge. All of this is done in a couple of minutes. With this method I can keep all of my planes razor sharp, making all of my plane operations work better, and still have time to do woodworking. I hope this answers your question. Please let me know if you have any further questions about this.